Since I wrote to you I have changed my place of abode from Meerut to Roorkee, and the very day my letter left for England. On the 19th of January I arrived in this station and a very nice little place; it is more like home than anything I have seen in India. We are quite close to the Himalaya Mountains, the lowest range (the Sewaliks) is only 14 miles from here, and it is such a sight to see the snowy range. We can see the highest peak fine from our door and the place where the Ganges leaves the hills close to Hurdwar. I belong to Roorkee College now. I am Head Printer of the college press and have 41 men under me. My pay is better than it was; it is 120 rupees (£12) a month and free quarters. I expect to have a rise of 30 rupees a month more (£3) shortly; so what do you think of that? I am just the same as a civilian for I never put on regimentals. I have dropped the Sergt and am only “Mr J”; now we are very aristocratic! There are very large workshops here, just the same as home of course. Native workmen, but European overseers; they (the workshops) stand on the banks of the canal. The canal itself is a fine sight; it is more like a river, both as regards its breadth and its strong current. Just at the end of the workshops there is an aqua duct where the canal crosses a river- a splendid piece of workmanship, and a little further up there is a river (which) flows over it. The canal leaves the Ganges up at Hurdwar and joins it again at Cawnpore. It is used both for traffic and irrigation. This place is not so large as Meerut, but I like it a great deal better; it is a very healthy station and not so hot as Meerut. It is very cold in the morning here just now. Now my dear mother, I have said enough about myself and Roorkee. How is your own dear self? I trust well, and donâ€™t I expect a jolly blowing up when I receive your letter for being so negligent. But give us a chance and you wonâ€™t have to blow me up any more. Becky is well and quite delighted about the change. Little Jamie is well and has lots of room to run about her. Bye the bye, there is a large garden in front of my door on a slope with three terraces across it, with steps leading down from them for the use of us benighted individuals-so aint that first rate? There are a great number of natives dying with starvation just now; it would make your blood run cold to see the objects that are moving about; more skin and bone. And yet, those are the wretches that would have murdered man, woman and child of us if they could, that are now going around begging. It is something like a judgement on them for it is only in the districts that the mutiny was worst in, that the famine is so bad. In Rohilcuree (?) there is no cultivation and last year no rain all over the Meerut district, and it is a very large one. Gram ( a kind of pea that is given to horses) is only 8 seers (a seer is 2 pounds) for 1 rupee (2 shillings), and before you would get 60 seers for 1 rupee- that will let you know how prices have rose. 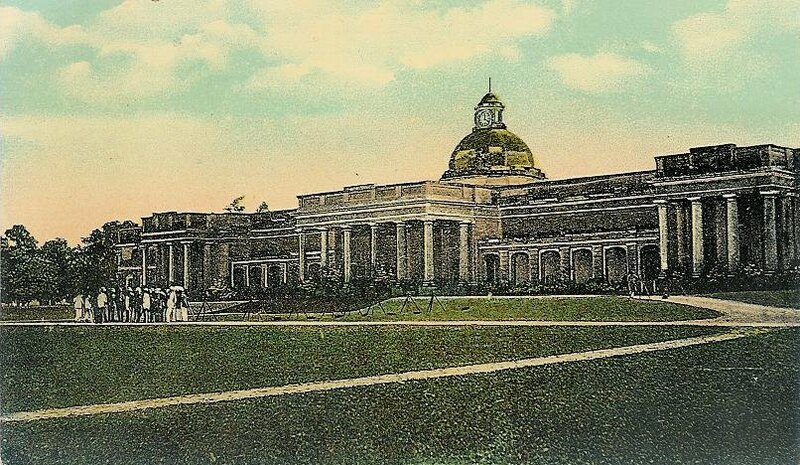 My dear mother, I send you a drawing of Roorkee College that is the front of it, and the building at the back is the printing office, in my charge. I will send you as many copies as you like. I will send one every mail. I have just come out of church and the mail closes today, so I am anxious to get it posted in time.